The McDonald's kids' meal is called a Happy Meal. The first kids' meal, Funmeal, emerged at Burger Chef in 1973 and succeeded. 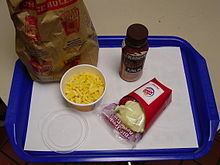 Discerning the popularity of the kids' meal, McDonald's introduced its Happy Meal in 1978,[note 1] and other fast food corporations, including Burger King, followed suit with their own kids' meals. 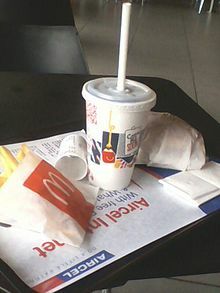 Some fast food corporations considered youngsters their "most important" customers, owing to the success of the kids' meal. Their effectiveness has been ascribed to the fact that the patronage of youngsters often means the patronage of a family and to the allure of the toys, which often are in collectable series. In 2006, $360 million of the expenditures of fast food corporations was for toys in kids' meals, which numbered over 1.2 billion. In recent years, the popularity of the kids' meal has receded, with a study by NPD Group indicating that there was a 6% decrease in kids' meals sales in 2011. Explanations include parents' realization that kids' meals are unhealthy, parents' desire to save money (opting instead to order from the value menu), as well as kids' outgrowing the meals earlier than before. Youngsters have "become more sophisticated in their palates" and seek items from the regular menu but in smaller servings. Kids' meal toys are also no longer appealing to the increasingly technology-oriented youth, who prefer video games. Also, the kids meal toys of Wendy's and Chick-Fil-A are no longer appealing to ages 8–12. Kids' meals have evolved in response to critics, offering healthier selections and greater variety. In 2011, nineteen food chains participating in the Kids Live Well initiative—including Burger King, Denny's, IHOP, Chili's, Friendly's, Chevy's, and El Pollo Loco—pledged to "offer at least one children's meal that has fewer than 600 calories, no soft drinks and at least two items from the following food groups: fruits, vegetables, whole grains, lean proteins or low-fat dairy". There have been concerns from food critics about the nutritional value of the kids' meal. A 2010 study by the Rudd Center for Food Policy and Obesity inspecting the kids' meals of twelve US food chains concluded that of 3,039 entrée combinations, twelve satisfied the advised levels of fat, sodium, and calories for preschool kids and fifteen those for older kids. Burger King has run kids meal promotions featuring toys of characters from PG-13 films at least four times, such as Small Soldiers in 1998, Star Wars: Episode III – Revenge of the Sith in 2005, and the Simpsons movie in 2007, One of the McDonald's toys featuring Minions characters in 2015 has caused controversy because parents have confused the gibberish talking minion with profanity. This was said to have taught young children an invalid language. As a result, the minion toys promotion was ended early, in July 2015. In the United States, kids' meals have been blamed for ingraining unhealthy dietary habits in youngsters and augmenting child obesity. In 2010, Santa Clara County, California implemented a ban on toys accompanying kids' meals that fail nutritional standards. San Francisco County enacted the same ban, and similar ones have been proposed or considered in other cities or states across the country. [note 2] Conversely, legislators in Arizona prohibited such restrictions, and Florida state senators proposed the same. Outside the United States, Spain and Brazil have also considered such measures. Chile has banned toys in kids' meals altogether. ^ Burger Chef filed suit against McDonald's over the Happy Meal but lost the case. ^ a b Bishop, Pete (20 March 1990). "Fast food meals for kids come under fire". The Daily Telegraph. Scripps Howard News Service. Retrieved 21 October 2012. ^ a b Reynolds, Annette (18 February 1989). "Restaurants serve up toys for kids". State Times. ^ Spartos, Carla (9 September 2009). "MC in a box". New York Post. p. 2. Archived from the original on 21 October 2012. Retrieved 21 October 2012. ^ Whitfield (26 September 2011). "New Factor Can Lift Stock, But It Can't Be Only Factor". Investor's Business Daily. Archived from the original on 21 October 2012. Retrieved 21 October 2012. ^ a b c d Smith, Andrew F. (2011). "Kids' meals". Fast Food and Junk Food: An Encyclopedia of What We Love to Eat. ABC-CLIO. pp. 393–394. ISBN 9780313393945. ^ a b Pedicini, Sandra (22 April 2012). "There's less appetite for children's meals at restaurants". Orlando Sentinel. Archived from the original on 21 October 2012. Retrieved 21 October 2012. ^ Horovitz, Bruce (28 May 2009). "Toys may be story in kids meals' steady decline". USA Today. Archived from the original on 21 October 2012. Retrieved 21 October 2012. ^ a b Smith, Joyce (27 June 2012). "Kids' meal orders decline as restaurants offer more healthful choices". The Kansas City Star. Archived from the original on 22 October 2012. Retrieved 22 October 2012. ^ Bernstein, Sharon (13 July 2011). "Restaurants to offer more-healthful fare for kids". Los Angeles Times. Archived from the original on 21 October 2012. Retrieved 21 October 2012. ^ Christian, Ken (8 November 2010). "Study finds healthy kids' meal choices are few and far between". NBC. Archived from the original on 21 October 2012. Retrieved 21 October 2012. ^ "Small Soldiers, Big Controversy". E! Online. 10 July 1998. Retrieved 29 April 2016. ^ "Critics take aim at Burger King's 'Star Wars' meal - May. 24, 2005". Retrieved 29 April 2016. ^ "OT: BK toys for PG-13 Simpson's movie". The DIS Disney Discussion Forums - DISboards.com. Retrieved 29 April 2016. ^ Jessica Eggert (9 July 2015). "Is this McDonald's 'Minions' toy saying 'what the f*ck' or what?". Mashable. Retrieved 29 April 2016. ^ York, Emily Bryson (10 April 2012). "McDonald's, rivals see diminishing appeal for kids meals". Chicago Tribune. Archived from the original on 21 October 2012. Retrieved 21 October 2012. ^ Bonisteel, Sara (28 April 2010). "Toys banned in some California fast food restaurants". CNN. Archived from the original on 21 October 2012. Retrieved 21 October 2012. ^ Park, Madison (1 December 2011). "Happy Meal toys no longer free in San Francisco". CNN. Archived from the original on 21 October 2012. Retrieved 21 October 2012. ^ Melnick, Meredith (6 April 2011). "New York City Council Considers Banning Happy Meal Toys". Time. Archived from the original on 21 October 2012. Retrieved 21 October 2012. ^ "Superior rejects ban on fast food toy". Associated Press. 8 December 2010. Archived from the original on 23 October 2012. Retrieved 23 October 2012. ^ "Senators reject ban on toys in Neb. kids' meals". Associated Press. 4 February 2011. Archived from the original on 22 October 2012. Retrieved 21 October 2012. ^ Levine, Dan; Lisa Baertlein (9 May 2011). "Fast-food lobbies U.S. states on Happy Meal laws". Reuters. Archived from the original on 23 October 2012. Retrieved 23 October 2012. ^ Abend, Lisa (1 December 2010). "In Spain, Taking Some Joy out of the Happy Meal". Time. Archived from the original on 21 October 2012. Retrieved 21 October 2012. ^ Ellsworth, Brian (15 June 2009). "Brazilian prosecutor wants to ban fast-food toys". Reuters. Archived from the original on 21 October 2012. Retrieved 21 October 2012. ^ "Chile Bans Toys in Fast Food to Attack Child Obesity". Associated Press. 2 August 2012. Archived from the original on 21 October 2012. Retrieved 21 October 2012. This page was last edited on 30 December 2018, at 06:23 (UTC).